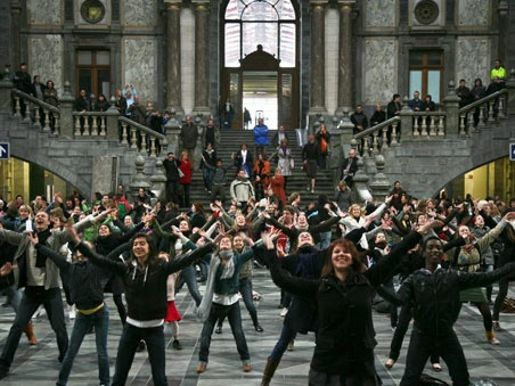 VTM, a television station in Belgium, recently used a flash mob dance stunt to announce their newest reality television program “Op zoek naar Maria”. The promotion, similar to T-Mobile’s ad set in Liverpool St Station In London, is promoting the program’s search for an an actress to play the leading role in the The Sound of Music. On Monday morning, March 23, commuters were introduced to the recording of Julie Andrews singing the song, “Do Re Mi”, as recorded for the 1965 musical, Sound of Music. 200 dancers strategically placed in the crowd began to dance as a remix of the track came through the speakers.